There's a bag named after her, she provides many with endless style inspiration, and her name is synonymous with French-girl style. We're talking about Jane Birkin, the latest muse of French fashion house Saint Laurent. Following the likes of Joni Mitchell, Courtney Love, and Marianne Faithfull, the 69-year-old stars in a series of ads for the brand as part of its ongoing Music Project. 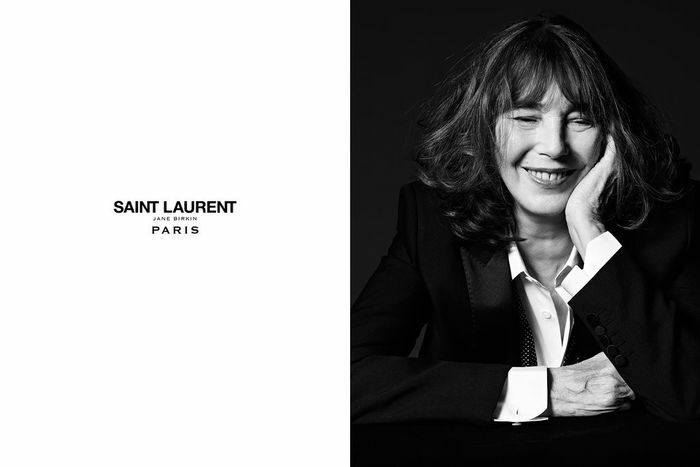 Saint Laurent designer Hedi Slimane photographs his muses for the campaigns, none of which are tied to a specific season, to promote the iconic women who have inspired him over the years. The understated black-and-white photos feature Birkin in the label's legendary Le Smoking jacket, which was crafted by Yves Saint Laurent himself in 1966 as part of his pop art collection. What better way to celebrate the iconic tuxedo than to have it modelled by one of the industry's biggest style icons? It's a match made in fashion heaven!